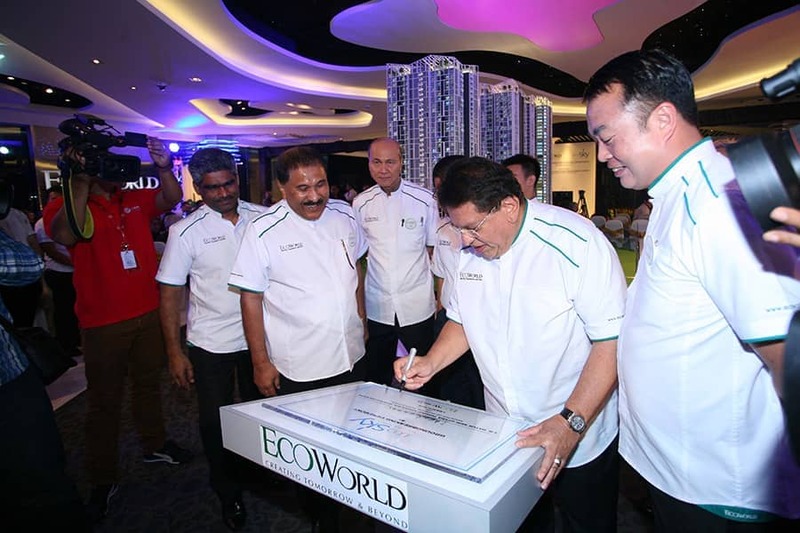 KUALA LUMPUR (March 4): Property developer Eco World Development Sdn Bhd has garnered a take up rate of 80% in its maiden project in Kuala Lumpur, which comprised of two residential towers. Its chief executive officer Datuk Chang Khim Wah said after a groundbreaking ceremony today that the two residential towers, named Tower Aurora and Tower Basalta, which were launched in Dec last year had been 80% snapped up. “We have allocate some for bumi (bumiputera) lots… Those are the units that we have not sold yet and the non-bumi lots have all been taken up,” said Chang. He added that the third and final residential tower, Clarita, would be launch very soon. The sizes of the units are between 800 sf and 1,900 sf with an average price of RM650 psf. The RM1 billion EcoSky project with a total of 975 units is slated to be completed by mid-2018. The groundbreaking ceremony was officiated by the Minister of Federal Territories Datuk Seri Utama Tengku Adnan bin Tengku Mansor.